I was contemplating what recipe would kick off 30 Days of Cookies, but it didn’t take long after concocting these little gems that the decision was made. 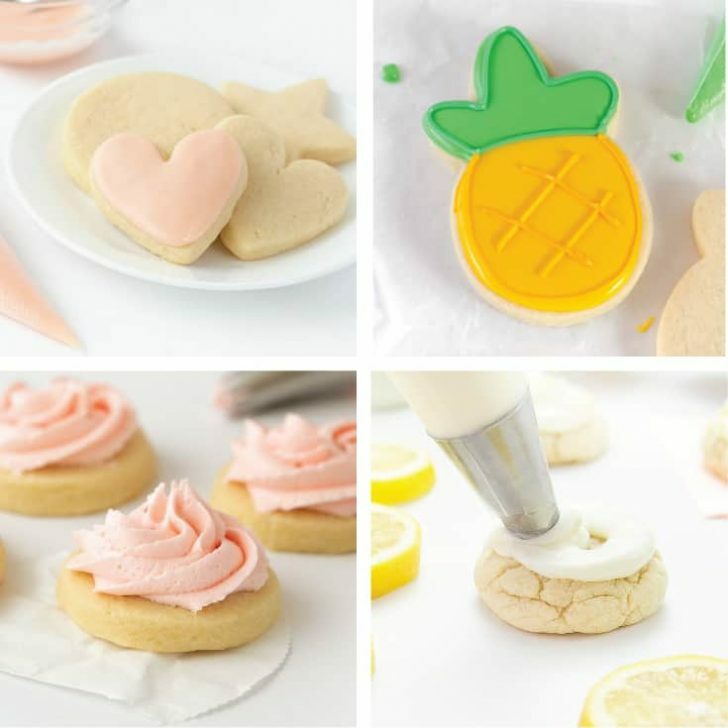 Before making these cookies, I was pretty convinced that no sugar cookie could beat my family’s go-to cut out sugar cookie recipe. 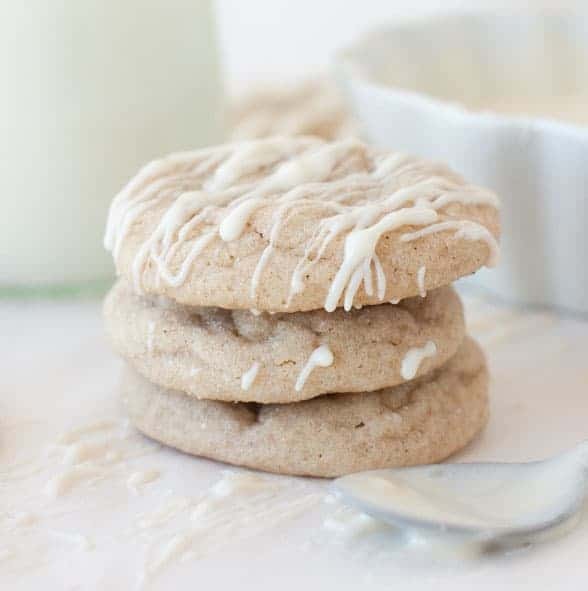 But these maple cinnamon sugar cookies give those cookies a run for their money, and *gasp* may even be my new favorite sugar cookie recipe. 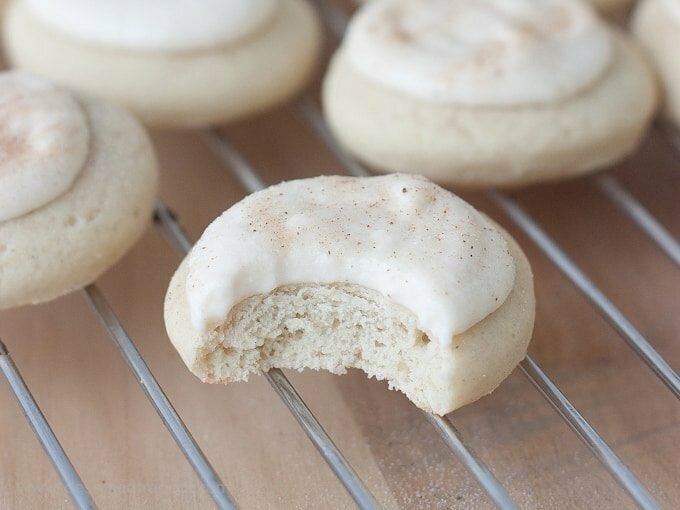 The cookie itself is soft, thick, slightly sweet, and has a hint of cinnamon flavor from the maple cinnamon sprinkle inside. 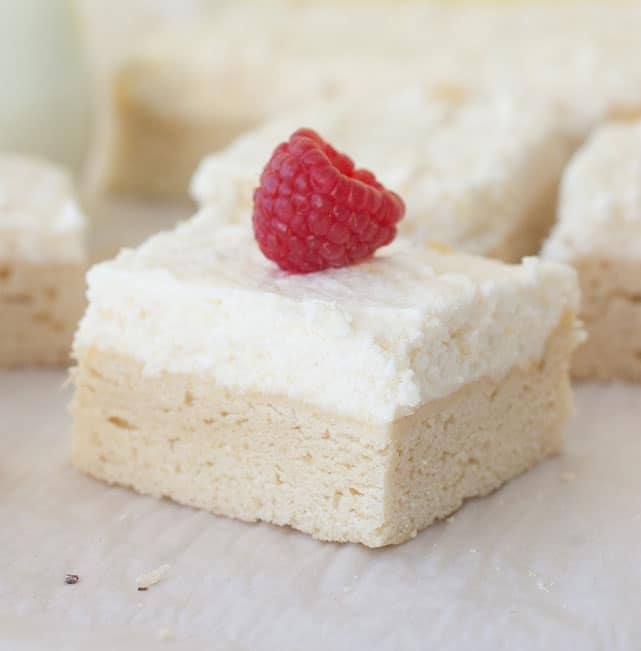 One thing I have discovered throughout my sugar cookie trials & errors, is that using powdered sugar (rather than all granulated sugar) gives the cookie the soft texture that makes them so good. I’m not a big fan of crunchy cookies, and in my opinion, soft, thick cookies are the only way to go. You can find maple cinnamon sprinkle in the spice aisle, and it’s one of my new favorite discoveries! 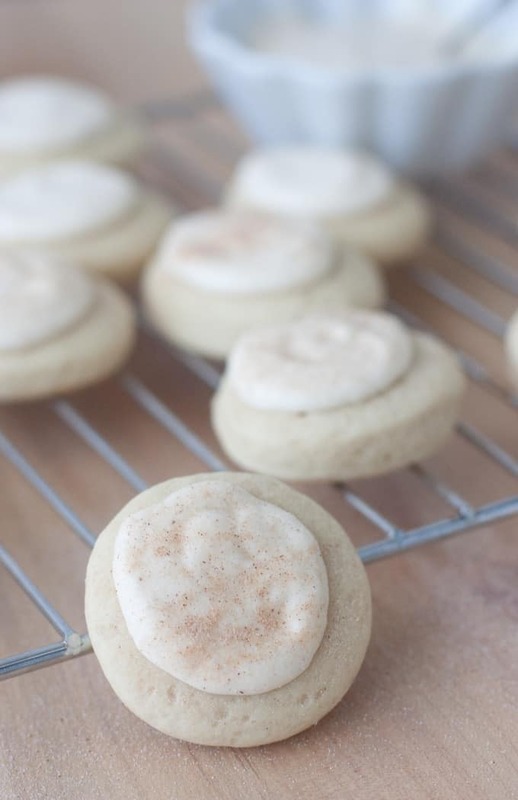 By baking these maple cinnamon sugar cookies for only 8-9 minutes, we are preventing the edges from turning brown, and therefore preventing them to get crunchy. Part of the trick to their softness is to allow the cookies to sit on the hot cookie sheet for 5-10 minutes after removing them from the oven. This allows them to finish baking, without getting the direct heat of the oven that typically causes browned edges. The cookies will most likely look slightly underdone after 8 minutes in the oven, and that’s okay. If you prefer a crunchier cookie, feel free to leave them in the oven for a few extra minutes until you start seeing the edges brown. 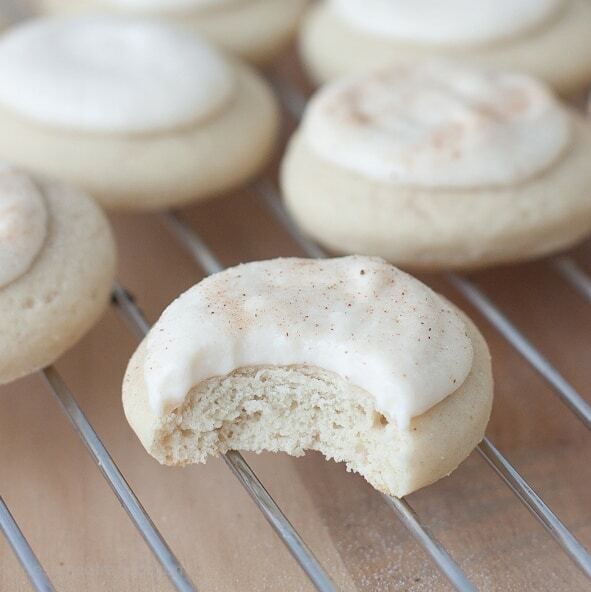 This is honestly one of those cookies that doesn’t even need the frosting to be good. Let’s just say that 2 cookies never lived to see the light of day a good frosting job. That being said, make. the. frosting. The cream cheese with a touch of pure maple syrup puts these things off the charts. Unlike a lot of sugar cookies I’ve had, these cookies aren’t overly sweet, yet have a toned down sweetness factor that doesn’t make me feel like I am rotting my teeth. I like to call this cream cheese maple “frosting” more of a glaze, because it’s a little creamier than traditional frostings you might make for cake or cupcakes. It’s not going to “harden” or set like some of the premade frostings you would find at the store. Because of this, I recommend storing these cookies flat (not stacked) if you are going to keep them around for a few days. After I spread the glaze on the cookies, I put the cooling rack in the freezer for about 20 minutes until the frosting set a bit. Because I forced myself to freeze them (rather than eat every single one), the freezing made them easier to stack in a freezer container. I put one layer down, covered it with wax paper, and then layered on the next row. You could also hold off on frosting them all together until you are ready to serve them. This way, the frosting won’t get messed up during stacking/freezing. If you don’t plan on eating these the same day you make them, store them in a airtight container in the refrigerator for 2-3 days. If you don’t plan to eat them within 2-3 days, pop them in the freezer. Like a lot of cookies, I find that they often taste better a day or two after you make them. Letting them sit (which I know is hard) allows the flavors to mesh together. 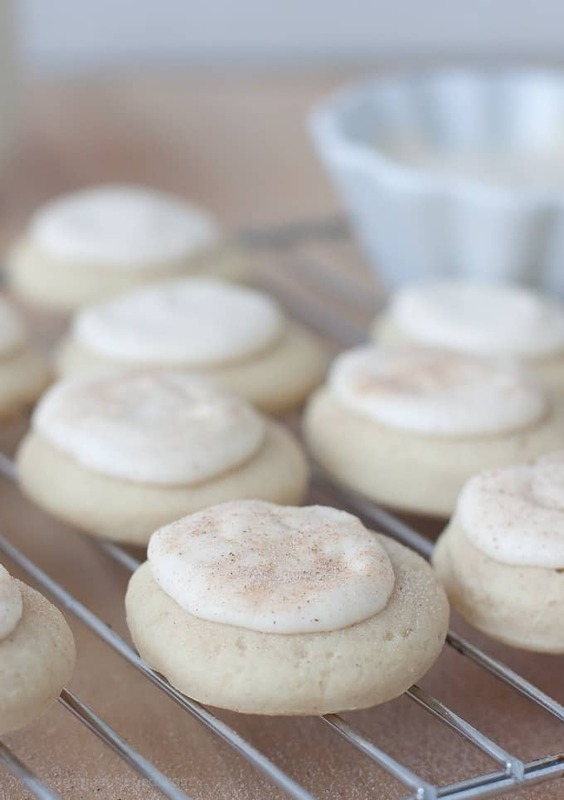 In addition to the cream cheese maple glaze, I topped each cookie with a bit of the cinnamon maple sprinkle. Mainly for presentation, but hey, a little extra sweetness doesn’t hurt. 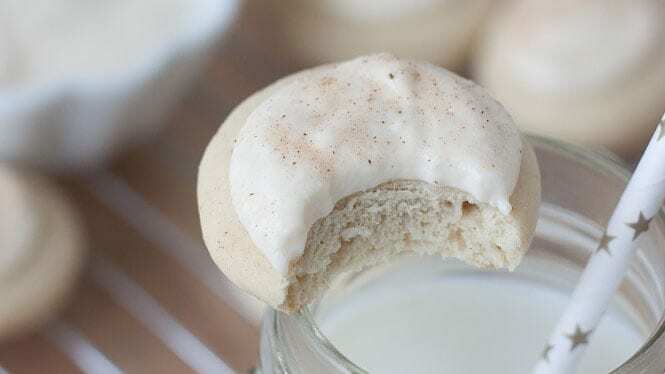 If you’re planning to freeze these, I recommend holding off on the cinnamon maple sprinkles until you are actually ready to serve them. 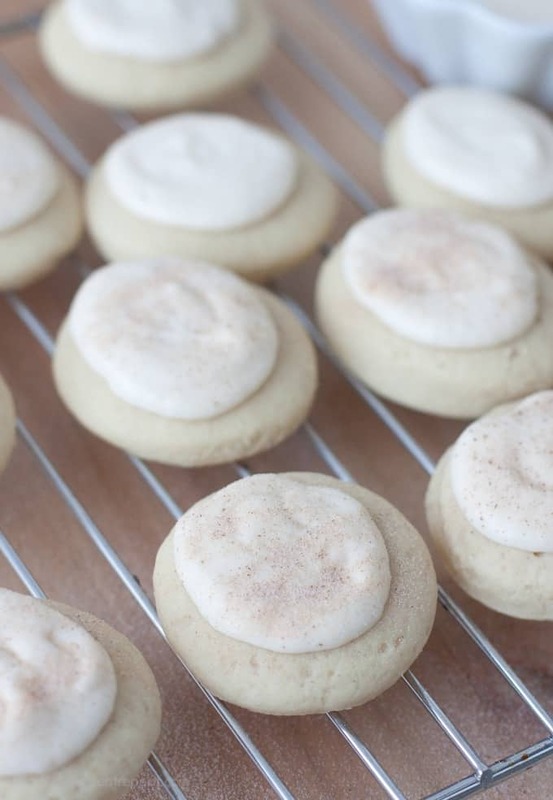 Cinnamon always dissolves a bit after it’s exposed to moisture, so for the prettiest cookies, sprinkle them right before serving. The cookie itself is soft, thick, slightly sweet, and has a hint of cinnamon flavor from the maple cinnamon sprinkle inside. In a large bowl, cream together butter, sour cream, sugar, and powdered sugar with an electric mixer for 1 minute. Add in vanilla, cinnamon maple sprinkle, and eggs and stir on low speed until incorporated. Add in baking soda and continue to stir on low for 10 seconds. One cup at a time, slowly add in the flour and mix on low speed until flour is incorporated. Form dough into a large ball and place on flour covered surface. Knead dough for 1 minute until dough is no longer sticky. You may need to sprinkle more flour onto the dough and continue to knead if dough is sticky. Using a rolling pin, roll dough between 1/4 - 1/2 inch thick. Using a 2.5 inch diameter circle cookie cutter, carefully cut out circles and place on ungreased, parchment covered cookie sheet. Allow to cool completely before icing. To make the icing, beat butter, cream cheese, vanilla, maple syrup, and powdered sugar with an electric mixer for 1 minute. Scrape down sides of the bowl and beat for an additional 20 seconds. 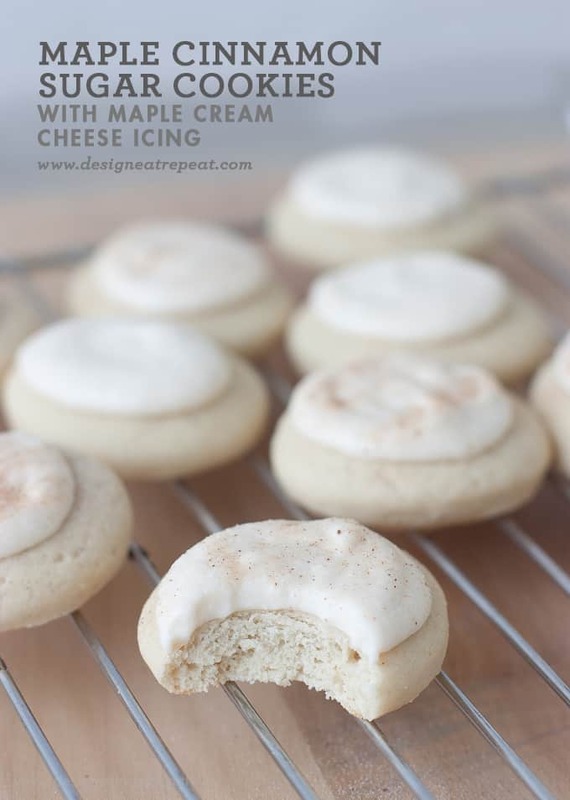 Top each cookie with icing and cinnamon maple sprinkle. If you don't plan to serve these immediately, store in the refrigerator in a airtight container for 2-3 days. If you don't plan to eat them within 2-3 days, store in freezer. By baking these cookies for only 8-9 minutes, we are preventing the edges to be brown, and therefore preventing them to get crunchy. Part of the trick to their softness is to allow the cookies to sit on the hot cookie sheet for 5-10 minutes after removing them from the oven. This allows them to finish baking, without getting the direct heat of the oven that typically causes browned edges. The cookies will most likely look slightly underdone after 8 minutes in the oven, and that’s okay. If you prefer a crunchier cookie, feel free to leave them in the oven for a few extra minutes until you start seeing the edges brown. With this cookie being in my top 5 cookies I’ve ever made, I have my work cut out for me in the 29 days to try and trump it. I have some fun ideas in store and I can’t wait to share them all. Wish me luck as I venture into this 30 consecutive days of blogging. I’m now accepting a kitchen cleaner, personal dish washer, and about 5 more cookie sheets. Mmk, thanks. 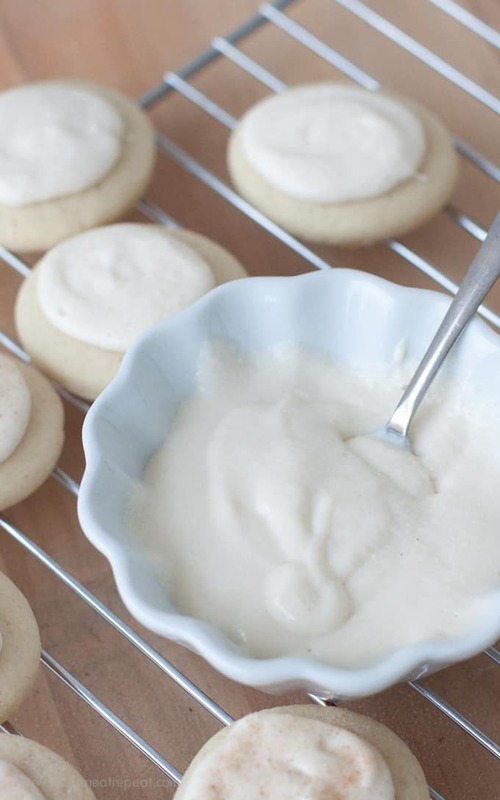 Love that you added maple to sugar cookies! These look perfect! I am so excited for your 30 days of cookies, and what a great way to start it off! These look so delicious! They sure are if I say so myself! I HAVE TO TRY THESE!! Yes, yes you do! And when you do, let me know how you like them! 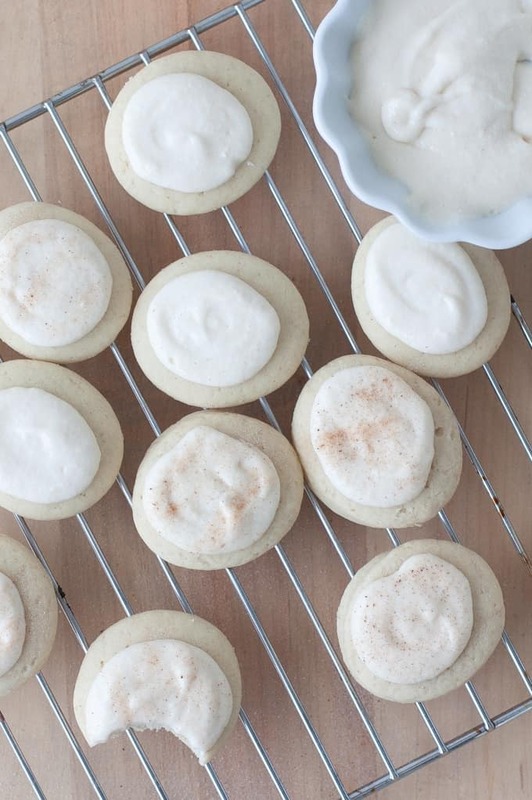 Love love love that you are doing 30 cookie recipes! These look amazing. I’m a big fan of maple anything. Thanks, Carrie! These are on the top of my list thus far for 30 Days of Cookies. Maple is just so darn delish.